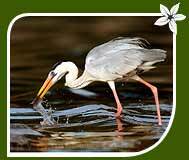 A grey heron is a wading bird and native to the temperate regions of Europe and Asia. It has the same size as that of a large egret. This bird stands quite tall, measuring 90-100 cm in height and 1-2 kg in weight with a wingspan of 175-195 cm. A grey heron is very similar to the American great blue heron. The upper plumage of a grey heron is largely grey whereas the underparts are off-white. The bird is lanky and has a long slender S-shaped neck with a narrow head and pointed bill. The bill, which is pinkish yellow in colour, is very strong and powerful. Its nest usually is a platform built with twigs. 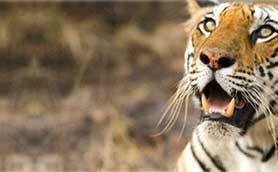 It can be spotted wading about in shallow water in search of prey that include fish and frogs. 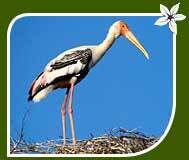 The painted stork belongs to the stork family Ciconiidae. The large wading bird is longer than the domestic bird. While it flies, its neck can be seen outstretched, as in case of other storks. An adult painted stork measures 95-100 m in height. 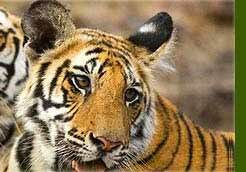 It breeds in countries like India and Sri Lanka along with southeast Asia. The plumage of the painted stork is white above with black flight feathers. The long bill is yellow in colour and is slightly curved near the tip. The face of the bird is waxy yellow and unfeathered while the tail quills are black. The young ones have the same pattern of colours but are a duller version of the adults. The bird eats upon fish, frog and large insects. The slim and slender River tern has the size of a pigeon. It is mostly seen in freshwater. 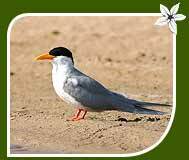 Also famous as Indian river tern, this bird species breeds in colonies, between March and May. This medium size bird measures 38 to 43 cm in length. The upper plumage of a river tern is dark grey whereas the underparts are white. The legs of the bird are red and short and the bill is deep yellow. It plunge-dives into the water in search of fish, crustaceans, tadpoles and other aquatic insects. Both the sexes are similar in appearance. However, the juveniles are characterised by a brown head, grey upper parts streaked with brown, grey breast and white underparts. It lays three eggs which are greenish grey to buff in colour and are streaked with brown too.